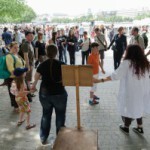 ← Soapbox Science: Maggots, honey, a back brush and 10kg of rice….. Inspired by PVC Professor Hilary Lappin-Scott’s experience of talking about science from the soapbox in London 2013, Swansea University is hosting its first Soapbox Science event on Saturday 5th July 2014. Our soapboxes will be positioned overlooking the magnificent expanse of Swansea Bay next to the 360 Beach and Watersports centre and café. The Bay will be buzzing with cyclists, joggers, dog walkers, and families out for a walk – we aim to stop them in their tracks with amazing women talking about amazing science! Swansea is a perfect location for a Soapbox Science event. The city has a rich industrial heritage and history of engineering and science with Swansea University at the forefront of science and technology innovation. Our mission is to raise the profile of women in STEM subjects (Science, Technology, Engineering, Mathematics) and to break down the myth that only men can become mathematicians and engineers. Do you think you could inspire the public about your science? Could you motivate young women and girls to believe they could aspire to a career in science? We need you to get out of the lab and onto the seafront to bring your work to the public. If you would like to be a Soapbox speaker please apply using the form (it’s short and easy to complete) on the Soapbox Science home page and send it to soapboxscienceswansea@gmail.com by 28th February. You can also read about Professor Hilary Lappin-Scott’s adventures from the soapbox here!